A skunk takes a late-night marathon swim session in Stamford. Officer Tilford Cobb of the Stamford Animal Care and Control Office was called out to pulled a skunk out of a swimming pool midweek, Director Laurie Hollywood said during the weekly animal reports roundup. 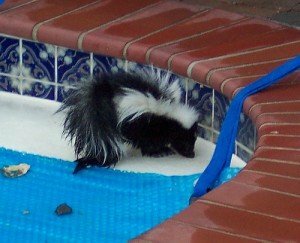 Cobb said the skunk had been swimming around in the pool since approximately 3 a.m. the night prior at a house on Westhill Road. The family apparently reported the animal being stuck in the pool but was worried about trying to pull it out themselves. Hollywood stressed there are 24-hour wildlife removal companies that will respond in the middle of the night to save the animal. This entry was posted in News on August 30, 2012 by Chaos Wildlife.